The New York Islanders were all over the media in the past days. Hot streaks, arena issues, Greiss resigning. And somehow a little tiny item which could answer all their prayers slipped through the cracks. To stay up on all New York Islanders news, and Islander fan opinion, I visit lots of sites every day. Including, but not limited to, Eyes on Isles. Reading comments on fan sites can be mind-numbing, misleading, and inflammatory. And yet every once in a while there’s a gem. For example, a couple of years ago on Islandermania.com there was a poster named Rickey Red. Ricky, who seemed to appear from nowhere, saying Charles Wang had an agreement in principle to sell the team. Low and behold, within days we all heard it was true. Another example was the Okposo eye-gate. A poster claimed that Kyle Okposo‘s babysitter told him that Kyle needed immediate, career-threatening eye surgery. The team denied it. Staple investigated and said it was untrue. And three days later Okposo had eye survey. So, yeah. Sometimes there is an insanely important nugget of information floating out there that we all look at and causally brush aside. Last week, a poster in the comments section of Lighthouse Hockey came up with this doosey. He claims to know someone who works with a nurse, who happens to be Casey Cizikas‘ wife. Apparently, Mrs. Cizikas has been dejected and depressed lately since learning that Mr. Snow and Mr. McPhee have made a deal stating that Casey would be the one chosen by Las Vegas in the expansion draft. Nope. I have no clue who that person is who wrote the comment, or whether he (or she) has a credible track record. On first glance, we are all tempted to call this highly implausible. Among the challenges to credulity are the unlikelihood that ANY deal was already struck, the long shot that Cizikas has been notified, and of course, the one-in-a-million chance that the writer wasn’t just hoping some fool like me would take the bait of his tall tale. On the other hand, with most teams looking to protect seven forwards and only three defencemen, McPhee might well be looking for whatever solid forwards he can find. And the new deal Casey signed seemed like more money, and more term, than is reasonable. What if Vegas is looking for a shining example of “how to play the game the right way”, and looking for a guy they could put a letter on for a few years? They need their Ed Westfall, and maybe they just guaranteed it? More from Eyes on Isles: What are the Pros and Cons of Coaching the Islanders? 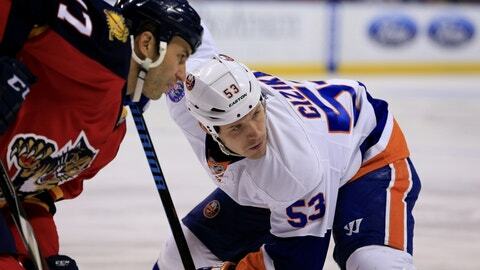 Putting aside for a moment that Cizikas is one of my favorite Islanders, I can see Garth’s thought process here as well. This would allow the Islanders to effectively protect all their many defencemen, and all their young scoring forwards. But something else is even more important. Should this be true, the New York Islanders would have a tremendous advantage in trades for the next six months. It means teams with too many quality players to protect, could trade them to the Isles. The one team that would have no fear of losing them in the draft. Maybe at a discount. It means the Islanders are likely the only decent team that could trade draft picks and prospects for established players on continuing deals without peril. If this were true, I fear trading Hamonic or de Haan, knowing they might lose Hickey in the draft, and then Seidenberg to retirement. That’s three of the top six that need to be replaced. If this isn’t true, I am much more comfortable including de Haan, or Pulock, in a deal for a Matt Duchene. I guess this is how crazy rumors and conspiracy theories start on the internet. Someone makes up something crazy. One guy explores the unlikely possibility. And then the third person starts presenting it as a fact. Maybe it is, maybe not.